BBQ – Kissing Summer Good Bye..
BBQs are fun. With friends around you, all happily bumming you up with Teasers and joyful memories. With Summer in a mood to say good Bye, a bunch of our friends gathered together last week for kissing Good bye to the Warm and Lively weather. 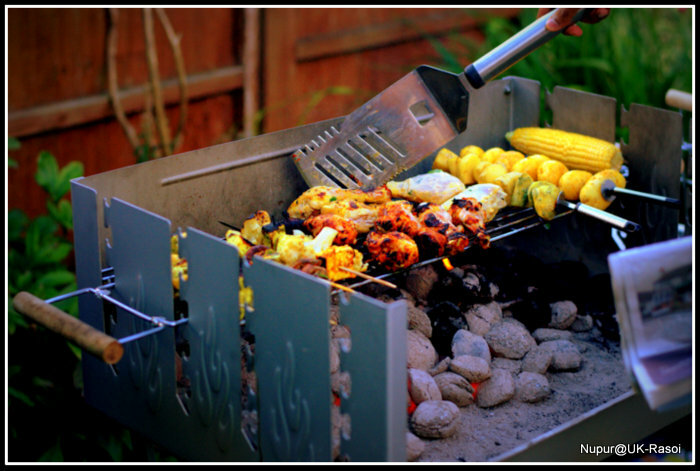 Being pure vegetarian, I had never been into Barbecues that much, but somehow this time my interest in this method of cooking ignited.. since we did a lot of Veggies this time which made me ponder and I surfed for some more facts about barbecues. Wish to present some of them to you, along with a sneak peek on the pics we clicked on the day..
Barbecue (also barbeque, BBQ, bar-B-Q and barbie) is a method and apparatus for cooking meat, poultry, and occasionally fish with the hot smoke of a fire, smoking wood, compressed wood pellets, or hot coals of charcoal. In the USA to grill is to cook in this manner quickly, while barbecue is typically a much slower method utilizing less heat than grilling, attended to over an extended period of several hours. In Australia to barbeque (most common spelling in Australia) is to quickly cook food on a heated metal plate.Barbecue is usually done in an outdoor environment by cooking and smoking the meat over wood or charcoal. Restaurant barbecue may be cooked in large brick or metal ovens specially designed for that purpose. The word “barbecue” is no match for a spelling bee. It can be written as “Barbeque,” “Barbicue,” “Barbique,” “Bar-B-Cue,” “Bar-B-Que,” “Bar-B-Q,” “BBQ,” “Cue,” and “Q.” The spelling changes depending on where you are from, what your preference is and how you grew up spelling it. But either way, all of the above are correct spellings. In British usage, barbecuing refers to a fast cooking process directly over high heat, while grilling refers to cooking under a source of direct, high heat—known in the US and Canada as broiling. In US English usage, however, grilling refers to a fast process over high heat, while barbecuing refers to a slow process using indirect heat and/or hot smoke (very similar to some forms of roasting). For example, in a typical U.S. home grill, food is cooked on a grate directly over hot charcoal, while in a U.S. barbecue, the coals are dispersed to the sides or at significant distance from the grate. Even before the US Civil War, barbecue was a popular meal choice. It was originally used to describe the smoking of whole pigs or steers over open fires. People would gather from miles away just to taste the delicious barbecued meat. Not long after that, the trend spread to various areas of the United States and different ways to cook barbecue, along with different sauces, were developed. According to the Hearth, Patio and Barbecue Association, there are over 2.5 billion barbecues held every year in the United States. That takes a lot of sauce! A little known fact about barbecue grilling is that ninety percent of grillers use barbecue sauce to add zest to their meat and poultry. Can you guess which flavor of sauce is the most popular? The most popular flavors of barbecue sauce are hickory, followed by mesquite, honey, and then spicy-hot. Pineapples, bananas, peaches, nectarines, plums, mangos, pears, and papayas taste great grilled. Cut the fruit in half, remove the cores (or pits) and grill with the skin side up before turning over. Grilling caramelizes the natural sugars in fruit, creating a softer texture, richer flavor, and more concentrated aroma. Unlike vegetables, which are less delicate, fruit should be grilled over indirect heat to prevent overcooking. I found some very good Vegetarian recipes for Barbeque on the BBC Good Food website here and some irresistible experiments here . And this one from Tarla Dalal is tried and tested recipe, a masterpiece and default preparation. God knows when will I have this way of enjoying veggies and chicken legs in my backyard ! Wow wish to join u guys..
beautifully written and lovely pic. Who cares about the spelling when the food prepared looks this good? why dont you try somthing south indian..
lovely post nupur …and ofcourse lovely pics as well ..